Albert Snyder, the father whose slain soldier son's (Marine Lance Cpl. Matthew Snyder) funeral was targeted by Fred Phelps and his Westboro Baptist Church picketers, has been ordered by the Court of Appeals for the Fourth Circuit to pay court costs for the WBC. The Court of Appeals threw out Snyder's case last year after a lower court awarded him an $11 million judgment (which was later halved). The U.S. Supreme Court then agreed to take on the case. The AP reports: "On Friday, Court of Appeals for the Fourth Circuit ordered that Snyder pay costs associated with the Fred Phelps' appeal…The funeral for Marine Lance Cpl. Snyder in Westminster was among many that have been picketed by members of the fundamentalist Westboro Baptist Church in Kansas. Westboro pastor Fred Phelps and other members have used the funeral protests to spread their belief that U.S. deaths in the Iraq war are punishment for the nation's tolerance of homosexuality. 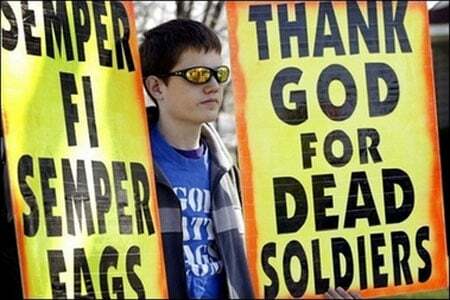 One of the signs at Snyder's funeral combined the U.S. Marine Corps motto with a slur against gay men." Snyder's case will be heard by SCOTUS this fall. A fund for him is set up here.